Cleverly-Bellew: Who’s ‘0’ will go? The wait is finally over as bitter rivals Nathan Cleverly and Tony Bellew clash at Liverpool’s Echo Arena tonight for the WBO light-heavyweight title. After months and months of back and forth trash talk, the two get the chance to settle their differences in the ring. I’m not too sure why there is so much animosity between the pair, so much so that the police were called after Nathan’s father/trainer clashed with members of the Bellew team during a press conference, but the time for talking is now over. Cleverly is the favourite with the bookies but Bellew shouldn’t be under-estimated by anybody. Bellew packs a thunderous punch and Cleverly would be best served not to let Bellew test his chin too much. This fight has the potential to go down alongside the other great all British wars. Eubank-Benn, Clazaghe-Woodhall and Cooper-Bugner. Promoter Frank Warren has said that the winner of this will be looking at the winner of Dawson-Hopkins, with the preference being the living legend Bernard Hopkins as he would be the bigger draw. For me, this is the wrong direction to take either of these fighters in. Both are good fighters, Cleverly with the potential to be a real good boxer but the likes of Hopkins and Dawson, when his head is right, are levels above these two fighters at the moment. I expect this to be a good old fashion tear up, with both fighters doing their best to knock each other out. The animosity between the two is so fierce that it makes DeGale and Groves look like the best of friends. Bellew has said he’ll look to box Cleverly, which would be a mistake for him. Cleverly is a better boxer. Bellew’s best bet is to drag this into the trenches and turn it into a real war. If he catches Cleverly clean; we’ll really see how good his chin is. Cleverly should really look to box Bellew and not get drawn into a slug fest; which can happen with Cleverly as we’ve seen in the past. He has to stick to using his skills and not get drawn into Bellew’s kind of fight. I’m expecting a cagey opening couple rounds as both boxers try to figure each other out before things eventually explode into action. I do think Cleverly will look to stand toe-to-toe with Bellew and try and blast him out of there, even though I think this is the wrong option for him. But I expect Cleverly to retain his title via a late stoppage. James DeGale is ready to “win in style” as he looks to claim the European super-middleweight title from Piotr Wilczewski tonight. DeGale, fighting for the first time since his controversial defeat to bitter rival George Groves, believes he will rise to the occasion and silence his critics. Despite the loss to Groves, it’s DeGale who has landed the shot for the European title. This is a massive chance for DeGale, with a win putting him in the frame for a potential world title fight at some stage next year; not to mention the eagerly anticipated rematch with Groves. It will be a tough fight for DeGale as his opponent has only lost one of his 30 fights but I expect DeGale to really put on a show and earn a stoppage victory, somewhere between the 7th and 9th round. DeGale will have to put any talk or a rematch with Groves out of his mind during tonight’s bout and concentrate on the task ahead of him and let his boxing skills do the talking. If he does that; he wins this fight and the rematch with Groves will come. Darren Barker’s brave world title bid ended courtesy of an 11th round KO at the hands of Sergio Martinez. Barker put up a valiant effort as he stifled Martinez attack and limited the champ to very few openings. The champions’ power eventually told though as he landed a brilliant right hand that caused Barker to hit the canvas. Barker proved a lot of people wrong by lasting as long as he did with Martinez and limiting the champ to very few attacks. But Barker rarely troubled Martinez, despite giving the champ a bloody nose in the 4th. Barker continued to work the bloody nose of Martinez in the 5th but Martinez stepped it up a gear in the 6th and landed with some good combination work. Martinez began to show his class and finished the 7th and 9th round better. The champ stepped it up a notch again in the 10th as he rocked Barker with two solid rights which caused Barker to return to his high shell guard to see out the round. As Barker tried to open up in a bid to win the round in the 11th, Martinez landed that high right that caused Barkers’ knees to buckle and end the fight. Barker walked Martinez down well enough, with his high shell defence working well. Yet it was his failure to really let his hands go when he had the chance that really put Barker at a disadvantage. If you don’t throw punches, you don’t win fights. Martinez, who wasn’t at his best, kept his hands low throughout the fight, almost goading Barker to trade with him. Had Barker done this, it is quite likely that he would have been KO’d earlier and this could be one of the reasons Barker was unwilling to let his hands go. Barker by no means disgraced himself and should get himself a world title fight again; but he has to learn from this fight. He has a very good defence and a good boxing brain; but has to throw more punches. On a side note; I can’t believe that Sky Sports Jim Watt had the fight (I believe) even going into the 11th round. Yes Barker did well; but he wasn’t doing enough to win the rounds. In a championship fight, as the challenger, you have to WIN it. You have to be more active and really take the title from the champion, especially if your fighting away from home. I had Barker winning 2, possibly, 3 rounds. I do find it very odd how Jim Watt managed to score it the way he did; but we all look for different things in boxing. 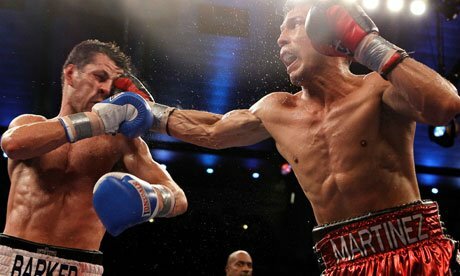 ‘Dazzling’ Darren Barker will be hoping to cause an almighty upset as he looks to dethrone middleweight king Sergio Martinez at the Boardwalk Hall in Atlantic City. Barker faces an uphill task as he takes on a boxer many pundits, and myself included, consider number 3 on the pound-for-pound (P4P) list. This is a massive step up in class for the likeable Barker, who has conquered the British, Commonwealth and European divisions. One thing is for sure, you cannot fault Barker one bit for what he has achieved. The real question is; does he have what it takes on the elite stage? Sadly I can’t see Barker taking the south-paws ‘The Ring’ World Middleweight title. I like Barker. He’s a very good boxer, very textbook with his style. He possess a good jab, a good straight right, good temperament and he seems like a really down to earth guy. I just don’t think he has enough speed or power to trouble Martinez. I will be rooting for ‘Dazzling’ Darren and really hope he puts in a fantastic performance, whatever the result. He’s had quite a hard time in his personal life but he’s done fantastically well to come back and to win the European title in his comeback fight was a brilliant achievement. Hopefully he puts on a good enough performance to impress the American’s over there to earn himself some further chances. But I’m afraid Barker will follow in the footsteps of Mathew Hatton, Ryan Rhodes and Brian Magee. A ‘heroic failure’ sort of performance is on the cards tonight. As much as I like Darren, I don’t see him having the required power or speed to really trouble a focused Martinez. Martinez does like to fight with his hands quite low when he’s out of range and Barker will have to try to take advantage of that. His best bet is to stick that jab all night and use his good straight right whenever possible. Barker does posses a decent left hook too and he’ll have to use that to counter Martinez as he comes in. But sadly I think Martinez has too much power and speed to defeat Barker. Martinez also possesses that rare one punch KO power (just ask Paul Williams) and Barker will have to be aware because Martinez can hurt you with either hand, particularly the left. If Barker doesn’t freeze early on the big American stage (ala Calzaghe-Hopkins/Jones Jnr and Froch-Taylor) then I can see him taking Martinez into the later rounds. If Martinez is unfocused then Barker does have a chance but his lack of power will seriously hurt his chances. Martinez to win by KO late on. All the best Darren. I, for one, hope you prove me wrong. 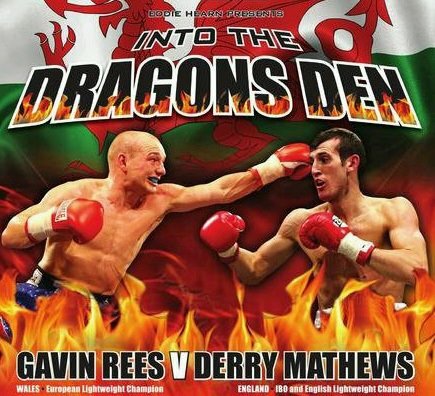 Gavin Rees retained his European lightweight title after his fight with Derry Mathews ended in a technical draw. Mathews suffered a broken nose after a clash of heads in the 4th round. The ringside doctor, after taking a closer look, had no choice but to call the bout off resulting in the technical draw. Whilst the fight was close with Rees using his surprisingly quicker hands to walk down and bully Mathews; who looked to counter the smaller Rees as he walked in. The first round probably shaded the 1st round, as he landed some eye catching combinations. Rees, who was warned twice for hitting below the belt, struggled to get into the fight in the 1st round but upped the pace in the 2nd, 3rd and 4th rounds as his bullying styled began to work. The fight began to pick up the pace in the 4th with both Rees and Mathews landing some great combinations. But just as the action started to hot up; the back of Rees head caught Mathews as they traded at close range. Blood streamed from Mathews nose and there was no doubt that the fight should be stopped leading to the technical draw. It was a disappointing end for the fight, but there is no doubt we will see these two back in the ring very soon. Gavin Rees will be hoping his boxing resurgence continues as he defends his European lightweight crown against Derry Mathews tonight at the Newport Leisure Centre in Wales. Rees will be hoping a victory against Mathews will put him into pole position to fight for a world title. “I don’t mind who I have to fight to win a world title,” said Rees. The 31 year old has been on a role since losing to Andriy Kotelnyk back in 2008, reeling off 8 wins. However in Rees last fight against Andy Murray (no relation to the tennis star I’m told), Rees faded badly as he stuttered over the finish line to claim the vacant European lightweight belt. Rees puts that down to slimming down to the 135 lb limit and insists his stamina will not be in an issue in this fight. Also in the last chance saloon here is Derry Mathews. 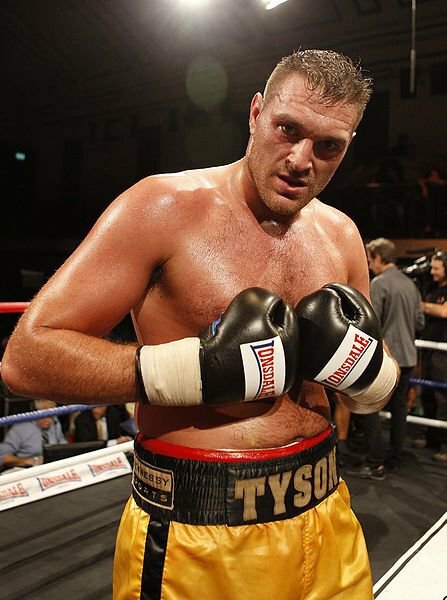 Once one of the hottest properties and brightest prospects in British boxing; he comes into this fight on the back of 4 straight wins following his crushing defeat in the Prizefighter final by Gary Buckland. Mathews boasts a slight height advantage and will have to use that to his advantage in what should be a good ol’ fashion tear up, and expect to see a few knockdowns along the way. This is definitely the last chance for these two to put them back in the frame for a world title fight and back into the British boxing spotlight. A loss and you won’t see any of these boys progress pass the European level. Expect a good ol’ fashion tear up as both boxers put it all on the line. I’m expecting to see a few knockdowns along the way but eventually I think Rees will come through with a stoppage win late on.